Powers/Abilities: Magnus has a number of magical abilities, including astral projection, formation of shields, projection of energy blasts, illusion casting, spells of forgetfulness, thought projection, simple conjuration, etc. (Avengers I#241 (fb) - BTS) - Magnus was turned down as an apprentice by Merlin. (Avengers I#241 (fb)) - Magnus became the disciple of Morgan le Fay. (Avengers I#241 (fb)) - Magnus became first among Morgan's followers, and he eventually became her lover as well. He deceived himself into thinking that Morgan's hatred of King Arthur was of no importance. (Avengers I#241 (fb)) - Morgan le Fay gained possession of the Darkhold, and Magnus discovered that her hatred had given way to total villainy. On that day, their love died. (Avengers I#187 (fb) / Amazing Spider-Man Annual#22/4 (fb)) - Morgan led her band of Darkholders to summon Chthon from his nether-realm, hoping to use him for her purposes. However, the Elder God proved to be too powerful for their control, and they tried to banish him back to the nether-realm. Unable to force the demon from Earth, they instead imprisoned him within the mountain that would later be called Wundagore. (Avengers I#241 (fb) / Amazing Spider-Man Annual#22/4 (fb)) - Magnus stayed with Morgan's Darkholders for a little more than a year (since she had first found the Darkhold). Having beheld absolute evil in the form of Chthon, he began devoting every waking moment to the theft of the Darkhold. (Avengers I#187 (fb) / 240 (fb) / Amazing Spider-Man Annual#22/4 (fb)) - Magnus stole the Darkhold, secreting it to a high tower upon the Isle of Wight; the tower was protected by elaborate spells which prevented anyone of evil intent from entering. (Avengers I#241 (fb)) - Magnus continued his studies, alone and on the run. (Amazing Spider-Man Annual#22/4 (fb)) - Foreseeing the possibility that Morgan would kill him, Magnus performed the necessary ritual to prevent his spirit from passing on to the next plane at the time of his body's death. (Avengers I#241 (fb) / Amazing Spider-Man Annual#22/4 (fb)) - Eventually Morgan found him and slew his mortal body while he was astral projecting (see comments). (Avengers I#241 (fb)) - Magnus transported his spirit to the astral plane, though he remained highly weakened for centuries. (Avengers I#241 (fb)) - Magnus found that his spirit could not return to Earth for more than a day, unless he possessed a living human. (Amazing Spider-Man Annual#22/4 (fb)) - Around the 13th century, Magnus took up residence in Westminster Abbey in London. He dwelled there for seven centuries, keeping a vigil for any sign of the awakening of Chthon. (Avengers I#186 (fb) - BTS/ Avengers I#187 (fb) / Amazing Spider-Man Annual#22/4) <March, 1932> - Six weeks later, the Magnus-possessed Drew arrived at Wundagore's Citadel of Science, explaining his true nature and warning Herbert Wyndham (the High Evolutionary) that he must cease his activities on Wundagore immediately or risk unleashing Chthon on the Earth. However, Wyndham refused to believe any of his talk of the supernatural. (Avengers I#187 (fb) / Uncanny X-Men Annual#12/3 (fb)) - The Magnus-possessed Drew convinced Wyndham to train his New Men (animals evolved into humanoid form) as warriors in the Knights of Wundagore. Alhough Wyndham still refused to believe the threat of Chthon, he did see the purpose in possessing a warrior force, and also found that the code of chivalry functioned well in teaching the New Men morals and proper behavior. In addition, whether Magnus' intent or not, the sense of chivalry rendered the Knights unsuitable for use as Chthon's pawns, which the demon had considered. (Avengers I#187 (fb) / Uncanny X-Men Annual#12/3) <1958> - The Magnus-possessed Drew continued to supervise the Knights and was present when Magda Lennsherr arrived to deliver her twin children. Suspecting she might be a vessel for Chthon, Magnus scanned her and found her clean, but soon after he was gripped by the power of Chthon. 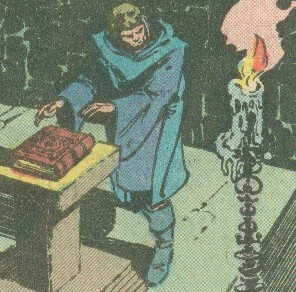 Magnus' power proved futile in a direct assault against Chthon's Other, and so Magnus released his astral self, locating Gregor Russoff who had used the Darkhold to perform the Spell of Ascension. Magnus possessed Russoff, forcing him to perform the Spell of Binding, which trapped Chthon within the mountain once again. Realizing what was happening, Chthon assaulted Russoff, leaving him nearly dead. (Web of Spider-Man Annual#4/4) - The next day, Magnus told Wyndham of his intent to return to the grave, relinquishing Drew's body. He left Wundagore mountain. (Spider-Woman I#2 (fb) - BTS / Avengers I#241 (fb) - BTS) - Magnus possessed a man in London. (Spider-Woman I#2) - Posing as a fortune-teller, Magnus introduced himself to Jessica Drew, showing great insight to her personality and history. Soon after, Morgan sent her agent, Excaliber, to try to force Magnus to reveal the location of the Darkhold. Magnus refused, and Spider-Woman defeated Excaliber, after which Magnus convinced her that the two of them should journey to America. (Spider-Woman I#3) - In Los Angeles, California, Magnus arranged for himself and Jessica to board at the home of Priscilla Dolly; he explained their relationship as uncle and niece. Magnus later brought Jessica to her father's grave, where she learned of his death for the first time, and later still directed her to investigate the police files on his death, learning of the involvement of Pyrotechnics, Inc.
(Spider-Woman I#4) - Magnus used his powers to neutralize Priscilla Dolly's instant dislike of Jessica Drew, brought on by her pheromone powers. After Priscilla's "sons" revealed their connection to Jonathon Drew and Jessica rushed out after William to learn more, a non-plussed Magnus asked for more potatoes. (Spider-Woman I#5) - Magnus conjured flowers to fill Priscilla's vase, after which she discussed her former husband, Nathan. 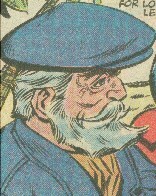 Shortly thereafter, Magnus was captured by Morgan, who threatened to kill both Magnus and Spider-Woman. (Spider-Woman I#6) - When Morgan's Doom-Slayers attacked Spider-Woman, Magnus agreed to allow her to find the Darkhold. He sent Spider-Woman to the apartment of Jack Russell, who had last possessed the Darkhold. At the same time, Magnus sent a telepathic message that caused SHIELD agent Jerry Hunt to track down Jessica. Russell turned into the Werewolf, but Spider-Woman captured him nonetheless. When Morgan tried to drain Russell's mind to learn the Darkhold's location, Magnus unleashed his astral self to stop her. 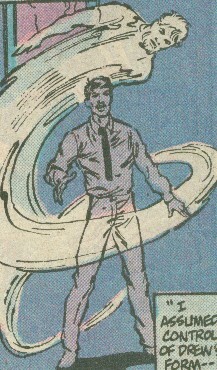 While their two spirit forms battled, Morgan fired an energy blast that seemingly incinerated Magnus' host body, and she then did the same to Jerry Hunt. However, as she was trying to summon her own body to the modern era, Spider-Woman's venom blast disintegrated her flesh and blood body, causing her spirit to fade. Magnus then revealed that he had faked his and Hunt's deaths, though his recent efforts had virtually exhausted his store of magical power. He then sent the Werewolf back to Russell's apartment, erasing his memory of the recent struggle in the process. (Spider-Woman I#7) - Magnus cautioned Jessica and Jerry in their efforts to learn her father's past, but eventually revealed at what point Drew had become involved with Pyrotechnics. He also discussed Spider-Woman's origins, though he neglected to tell her that he had formerly possessed her father's body. (Spider-Woman I#10) - Working as stage magician Charles Magnus, he invited Jessica to a party at the Hollywood Club. While Magnus basked in the attention of his female admirers, Spider-Woman fought the Gypsy Moth, who had assaulted the partygoers. (Spider-Woman I#11) - Returning home from a nightclub act, Magnus considered whether he should leave Jessica now. He detected a trace of magic in the air at Priscilla Dolly's house, and while he slept his magical powers determined the nature of the threat and subconsciously animated a group of dolls to awaken him. (Spider-Woman I#12) - Priscilla Dolly coerced Magnus to transfer her husband's spirit into Jerry Hunt, but he instead removed the spirit from the Brothers Grimm and had Spider-Woman, get Hunt to safety, leaving Nathan Dolly's spirit trapped in a mystical circle; Dolly's spirit dissipated soon after. (Spider-Woman I#13) - Magnus said goodbye to Jerry Hunt and Jessica as he took a flight to Las Vegas, allegedly to begin his act there. (Avengers I#241 (fb)) - Magnus released his recent host, returning to the astral plane. (Spider-Woman I#50) - Magnus took possession of Spider-Woman's boyfriend, David Ishima, revealing that Morgan had been causing her to hallucinate in hopes of driving her insane an potentially even stealing her soul. Magnus assisted Spider-Woman in releasing her astral self, and he brought her back to the sixth century, where he saved a woman from being trampled by horse and then had Spider-Woman possess that woman's body. As soon as they entered Morgan's castle, she magically bound Magnus, but Spider-Woman succeeded in knocking Morgan from her castle, and the spell that bound her there caused her body to disintegrate. However, when they returned to the modern era, they found that Morgan had taken her final revenge, killing Spider-Woman's body. Per Spider-Woman's wishes, Magnus cast a spell to cause all who knew her to forget she had ever existed, after which she accompanied him to the spirit realm. (Avengers I#240 (fb)) - Magnus' spell proved insufficient, and those who knew Spider-Woman remembered her as soon as they saw her. They performed CPR on her and she was taken to a hospital where she was maintained on life support. Magnus had known that there was a chance she could be revived, and he also knew his spell would fail, but he had fallen in love with her and wished her to come away with him. (Avengers I#240) - Magnus revealed to Spider-Woman that he had fallen in love with her and had wanted to spend the rest of time with her, and he also told her how he had known what might happen after her body was found. When she told him she wanted to return to her body, he told her how Morgan's spirit had conjured a blocking spell tied to her bio-electric powers. She agreed to risk losing them in order to return to life, but as he performed the spell to reunite her body and spirit, Morgan's spirit struck him down, interrupting the process. (Avengers I#241) - Magnus restored his astral self, revealing his full history to Spider-Woman and then sacrificed himself, using the last vestiges of his energy to overcome Morgan's spell and return her to life. As she awakened, he bade her farewell for the final time. (Secret Defenders #16 (fb) - BTS / 22 (fb) - BTS) - Dr. Druid took possession of several mystic artifacts once owned by Magnus, Jillian was assaulted by a demon released from one of the items. Jillian was slain, but Druid restored her using the Bride of Slorioth statue to retain her soul, and she received shadow-powers, becoming Shadowoman. Comments: Created by Marv Wolfman, Carmine Infantino, and Tony DeZuniga. One account of Morgan slaying Magnus' body shows her strangling it to death (Amazing Spider-Man Annual#22/4), while another shows her killing it with an energy blast (Avengers I#241). These don't need to be mutually exclusive, as she could have strangled him, that magically assaulted his body such that Magnus' magical power could not resurrect it. Admittedly, when I first read that story I didn�t realize that there was anything wrong with that date. However, when I later did some research about when King Arthur and Camelot supposedly existed, I found that most sources place Arthur�s reign in the early 6th century, with his death taking place at the Battle of Camlann in c. 537 A.D. (or 539 A.D. of 542 A.D.). In other words, if the birth year of 554 was accurate, then Magnus wasn�t born until after Arthur was already dead...which is inconsistent with his story. Furthermore, even if we ignore the real world�s ideas about when Arthur�s Camelot existed, there are still a couple of links between the Marvel Universe and real-world history to consider. Later stories have revealed that Saint Brendan was the one who dispersed the Darkhold pages across Europe sometime after Magnus placed the tome in the enchanted tower. Since Brendan is known to have lived from 484 to 578 AD, Camelot must have existed within that time frame. Other later stories also revealed that the Subterranean warlord Tyrannus was actually Romulus Augustus, a Roman who, as a boy, was elevated to the throne of the Western Roman Empire by his father Orestes in 475 A.D. and deposed after his father's death in 476 A.D. Since Tyrannus was apparently a healthy adult when he attempted to conquer Britain during Arthur�s reign, that would suggest that he was in his thirties at the time (i.e. not too young or too old). Assuming that he was born c. 480 A.D., that would mean that Arthur had to be ruling Britain at some time between 510 and 520 A.D.
Also, (Saint) Brendan aided Merlin against the Darkhold sometime between 537 AD and 550 AD.